Federal agencies recognize the importance of improving the customer experience and how technology can help. 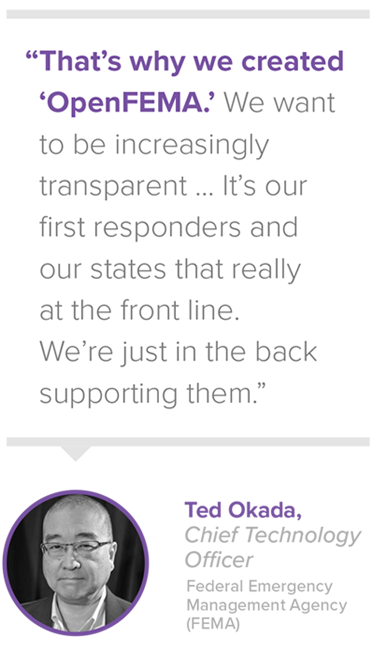 In this abridged Q&A, Federal Emergency Management Agency CTO Ted Okada shares how FEMA is marrying customer feedback with data analytics and cloud-based services to improve the customer experience for victims of disaster and for first responders. FedScoop: How important would you say technology is to FEMA’s mission — and to understanding and managing the customer experience? Okada: In our mission statement, we are to support citizens and first responders, state and local government, but first and foremost, survivors of disasters. When I think customers, I think of those survivors who are in the disaster zone and how do I meet their needs best? We work as a team — the back office is the front office — from solution design or early problem identification or pain points, all the way through how that translates into a solution and long-term infrastructure. FS: What steps has FEMA taken over the past year or two to improve the way it measures and uses customer experience feedback to judge how it’s doing and to enhance program performance? Ultimately, we want happy survivors. We want to ensure that these survivors are not in harm’s way again … and that communities and states can understand their risk. Those things are the ultimate metrics — where we can reduce loss of life and the loss of property. When I look at decisions, I use this meme: “How do you leverage the power of algorithms, the insight of the experts and the wisdom of the crowds?” We’re trying to get better standardized tools … and better analytics. [and focus on] what I call the aperture of data. The wider the aperture, the easier it is to generate better insight because the field of data is larger. We’re now sharing more machine-readable data than human-readable data. As a government, it’s not just that we do analytics, but that we empower citizens and universities and the press to run analytics. That’s why we created “OpenFEMA.” We want to be increasingly transparent. We don’t have all the solutions. It’s our first responders and our states that really at the front line. We’re just in the back supporting them. certainly going to be on solid technical ground. FS: If you were a citizen, how might you describe how FEMA’s customer experience feels better tuned to their needs? 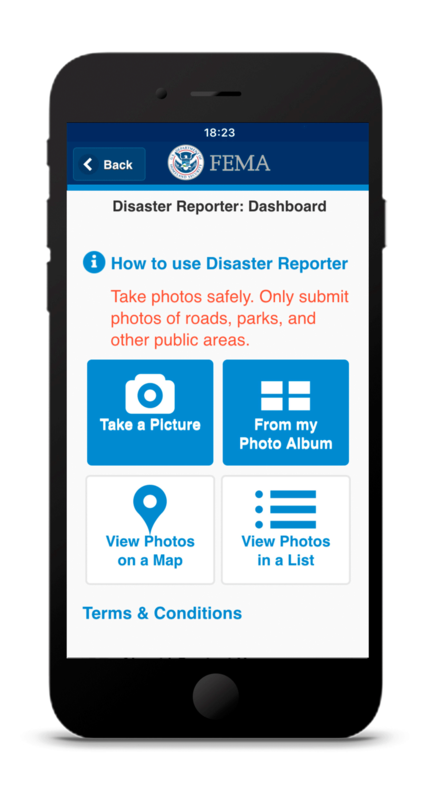 Okada: We have a feature called “Disaster Reporter” that allows for citizens to take photos of hazards, upload them and then they are shared by FEMA. We want everybody in the nation to use the FEMA app. The experience that really matters is that of the disaster survivors themselves. The former administrator used to say, “In a disaster, your world is as far as you can see, as far as you can hear, and as far as you can walk.” That is a different experience than most of us have every day. When I look at web design, mobile app design or any design, it’s not just an IT issue. What is the fundamental process? Is that process easier for the survivor? Is it easier for the local mayor or the local county or the state governor and their offices? That’s what’s driving us. Is it easier for them? They are ultimately my customers, the survivor and the first responder. FS: What might have been easier for survivors to accomplish after this year’s Hurricanes Harvey, Irma and Maria compared to past disasters? The challenge about this year in particular is scalability. We’ve had to take our entire infrastructure and scale it to literally millions of people to register for assistance. We’ve sent billions of dollars in assistance very quickly. We’ve had to target populations to [provide] housing solutions very quickly … and repeat this process over four major catastrophic disasters. We are having to scale this beyond what we’ve ever scaled before. Now we’re going to have to sustain it for many, many years ahead. So, when we say we need processes that are measurable and manageable, it’s also about them being repeatable, sustainable, scalable. FS: What’s changed to allow FEMA to scale at this level compared to a couple years ago? systems has been the biggest challenge. Cloud computing can be a catchall phrase, but really, it’s about how you get databases to perform faster and deliver that content faster via the web. We are in a situation where we now can begin to modernize a lot of those databases to perform much more effectively than in the past. FS: Looking ahead, what other areas are you focusing on in the way of user experience and design? emergency management systems, crisis management systems viewed through the lens of the end user? How do we integrate it from the state level to the federal level? Is the right kind of data getting to the right people at the right time? Those classic questions about system design. Also, cybersecurity. How do we authenticate users using single sign-on on devices so they don’t have to memorize passwords? We are getting them to that single sign-on future through two-factor authentication and FEMA’s really leading the way in that. Read more about how Accenture is helping agencies deliver superior customer experiences.